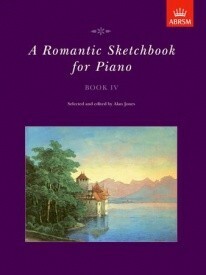 A Romantic Sketchbook For Piano, published by ABRSM, explores the wealth of piano music from the Romantic period in five carefully graded albums. Mostly composed between 1830 and 1930, the pieces in these albums have been selected to introduce players to a wide range of music, from works by some of the leading Romantic composers (such as Schumann, Mendelssohn, Grieg, Tchaikovsky and Debussy) to unfamiliar pieces by lesser-known figures like William Alwyn and Felix Swinstead. Each volume presents a variety of keys, time signatures and textures within a comprehensive range of tempi, which will be invaluable to students in the development of their musical skills. Players will also respond imaginatively to the varying styles and moods offered in these colourful sketchbooks, from the lively dances and mood pictures to the tender songs and gentle serenades. The five books in this series are graded in terms of difficulty, Book 1 being relatively easy and Book 5 advanced.